Sometime in the first decade of the 21st century, Tony Judt became what I term colloquially my “main man.” I tried to read everything Judt wrote. I was smitten by the enormous insight he brought to the subjects that most interested me – 20th century France and 20th European history and political theory. His best known work is a magisterial text about Europe since World War II, entitled simply “Postwar.” But his background also fascinated me. A near contemporary, born in 1948 in Great Britain of Jewish Eastern European immigrants, Judt was raised in South London, educated at Kings College, Cambridge, with formative years in Israel, France and California, before he wound up teaching at New York University. He also had what he termed a mid-life crisis, which he spent in Prague, learning the Czech language and absorbing the rich Czech intellectual and cultural heritage. All of the above is written in the past tense, as Judt succumbed to Amyotrophic Lateral Sclerosis (ALS or Lou Gehrig’s disease) in August 2010, at the age of 62. 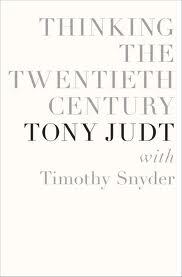 “Thinking the Twentieth Century” is likely the last book to bear Judt’s name as an author. An “Afterword” is eerily dated July 5, 2010, slightly over a month prior to his death. But “Thinking the Twentieth Century” is no conventional book. Rather, it is an extended series of conversations between Judt and Yale history professor Timothy Snyder. Twenty years younger than Judt, Snyder is the author of “Bloodlands,” a highly-acclaimed chronicle of mass killings in Poland and the Soviet Union in the 1930s and 1940s. Judt notes in his afterward that Snyder is one of the first Americans to rise to prominence as an historian of Eastern Europe. Previously, most distinguished Eastern European historians were refugees from that part of the world. Snyder interjects himself into the discussion, but is more like an interviewer, or at least close to it. His portion of the conversation is plainly overshadowed by that of Judt, almost certainly deliberately so. The two scholars range widely but, as the title suggests, their focus is what to make of the murderous 20th century in Europe. Their reflections center on Europe’s multiple 20th century ordeals, including two devastating world wars, the rise and fall of authoritarian ideologies – communism, fascism, Nazism – and, above all, the Holocaust, the still unfathomable destruction of Europe’s Jewish population. Interspersed with the authors’ conversations on these ponderous themes are Judt’s touching and poignant personal reminiscences of aspects of his life. Judt undoubtedly knew that this was likely among his last opportunities to speak publicly about himself and the ideas he cared about. was extraordinarily difficult for contemporaries. For the same reason, many people reassured themselves that the Holocaust could not be happening, simply because it made no sense. . . [I]t made no sense for the [non Jewish] Germans. . .Since they wanted to win their war surely the Nazis would exploit the Jews, rather than kill them at great expense. This application to human behavior of a perfectly reasonable moral and political calculus, self-evident to men raised in the nineteenth century, simply did not work in the twentieth (p.194). The Holocaust thus hovers over the European 20th century, it hovers over this book, and it hovered over Judt as a Jew. The “Jewish question was never at the center of my own intellectual life, or indeed my historical work,” he says. But as he grew older, he found it intruding, “inevitably, and with ever greater force” (p.12). For Judt, thinking Europe’s 20th century unavoidably requires trying to account in some manner for the Holocaust, an exercise for which our normal processes of reasoning and empirically based critical thinking are likely to prove insufficient. Judt’s insights into the 20th century’s totalitarian impulses –fascism, Nazism and communism — by themselves, make the book worth reading. Communists and fascists after 1917 shared, Judt contends, a “profound attraction to mortal struggle and its beneficial social or aesthetic outcomes” (p.102), along with distaste for modernist culture — both were “extraordinarily wary of innovation or imagination” (p.165). In Italy, fascism was not so much a doctrine as a “symptomatic political style” (p.65), which appealed by its contrast to liberal bourgeois democracy. Fascists don’t have concepts like leftists, he asserts. Rather, they have “attitudes. . . distinctive responses to war, depression and backwardness” (p.159). Without the threat of Bolshevikism, there would have been “far less space for fascists to offer themselves as a guarantee of traditional order” (p.163). The European idea, as we tend to forget, was then a right-wing idea. It was counter to Bolshevism, obviously, but also to Americanization, to the coming of industrial America with its ‘materialist values’ and its heartless and ostensibly Jewish-dominated finance capitalism (p.177). Judt saw no serious prospect for contemporary fascism. With the “coming of television (and a fortitori the internet), the masses disaggregate into ever-smaller units. Consequently, for all its demagogic and populist appeal, traditional fascism has been handicapped: the one thing that fascists do supremely well – transforming angry minorities into large groups, and large groups into crowds – is now extra ordinarily difficult to accomplish” (p.166). Judt considered the 20th century’s struggles — between democracy and fascism, communism and capitalism, freedom and totalitarianism — as, at bottom, “implicit or explicit debates over the rise of the state. What sort of state did free people want? What are they willing to pay for it and what purposes did they wish it to serve?” (p.386). Judt found his own answers in the rise of social democracies in much of Northern and Western Europe — democratic governments which tax at relatively high rates, provide significant welfare benefits, embrace capitalism and maintain free but extensively regulated markets, while respecting individual rights and the rule of law (my definition, not Judt’s). For Judt, social democracies refute the hypothesis of the economist Friedrich Hayek, who argued in his famous 1944 work, “The Road to Serfdom,” that any attempt to intervene in the natural processes of the free market is “guaranteed to produce authoritarian political outcomes” (p.343). Judt contends that European social democracies are “among the wealthiest societies in the world today, and not one of them has moved remotely in the direction of anything resembling a return to the German-style authoritarianism that Hayek saw as the price they would pay for handing initiative to the state” (p.383; Hayek, it’s worth pointing out, retains significant appeal in conservative and Republican circles in the United States). Interspersed with these macro-reflections on 20th century Europe are Judt’s micro-reflections on his personal life, his academic wanderings, and his two failed marriages — he gets in some digs against his ex-spouses, for instance. The macro and micro come together as he describes the movement of his own intellectual center of gravity from France and Western Europe to Eastern Europe. Particularly through two key Polish thinkers, Leszak Kolakowski and Jan Gross, Eastern Europe in the 1980s offered Judt a “fresh start” (p.207). Kolakowski was expelled from Warsaw University in 1968 for the flagrantly heretical view that Marxism itself, not simply the way it was practiced in Soviet regimes, was “bereft of political prospects or moral value” (p.197), a view which Judt ultimately adopted as his own. Gross was a contemporary of Judt. The two met in the mid-1980s when both were teaching in the United States. Through Gross, Eastern Europe began to offer Judt “an alternative social life” at a time of “renewed and redirected intellectual existence” (p.201). At the apex of Judt’s career, Eastern Europe “ceased to be just a place; its history was now for me a direct and personal frame of reference” (p.204). Judt made his reputation through studies addressing the very French notion of a “public intellectual,” a macro, big picture thinker who analyzes and comments upon public affairs, while standing outside of official structures (again, my definition, not Judt’s). One of his first works to gain widespread public attention, “The Burden of Responsibility,” was a treatment of three French intellectuals, Léon Blum, Raymond Aron and Albert Camus, whom he describes as “genuinely independent thinkers in a time and a place where being independent placed you in real danger, as well as consigning you to the margins of your community and to the disdain of your fellow intellectuals” (p.330). Thus, it was ironic that Judt became, during his time in New York, somewhat of an American public intellectual of the type he had written about. Judt contended that “no scholar, historian or anyone else is – merely by being a scholar – ethically excused from their own circumstances. We are also participants in our own time and place and cannot retreat from it” (p.285). After the September 11, 2001 terrorist attacks, Judt became “increasingly and polemically engaged in American public affairs” (p.286), in particular as a vociferous and highly-visible critic of the Bush Administration’s Iraq war and Israel’s Palestinian policies. This dialogue between two exceptionally sharp minds has a rambling quality. Like good dinner table conversation, the two shift ground frequently and often suddenly, and themes do not always follow one another with Cartesian or other logic. But having a last look into Tony Judt’s prodigious mind is an opportunity to be seized. We may not see such nimble and versatile thinking on Europe’s grotesquely unthinkable 20th century any time soon. 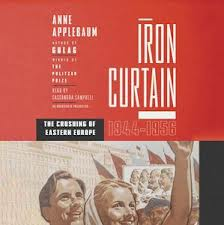 Anne Applebaum’s “Iron Curtain: The Crushing of Eastern Europe, 1944-1956,” sheds much light on a dark period, when the brutal Nazi occupation ended in Eastern Europe, only to be replaced by slightly less brutal communist rule. Although Applebaum covers the whole of Eastern Europe – the so-called “Eastern block,” those countries outside the Soviet Union that became communist – she concentrates during this 12-year period on Poland, Hungary and East Germany, which she has chosen “not because they were similar but because they were so different” (p.xxxii). There are also occasional references to Czechoslovakia, Tito’s Yugoslavia, and Bulgaria and Romania. Despite differences between countries, Applebaum highlights striking similarities among them and thereby provides an incisive overview of the gloomy and oppressive totalitarianism that prevailed across Eastern Europe during the period she covers. Writing for general readers and specialists alike, Applebaum divides her meticulously-researched book into two general parts, “False Dawn” and “High Stalinism.” “False Dawn” covers the period from 1944 to roughly 1948, during which there was a general if cautious optimism throughout the region that the countries liberated by the Soviets would be allowed to work out their own destinies in their own way. But the period of “High Stalinism,” 1948-1953, revealed this cautious optimism to have been entirely misplaced, as Stalin tightened the Soviet grip on all of Eastern Europe, except Yugoslavia. Applebaum’s study is not strictly chronological. In a single, final chapter, she treats two defining moments in Eastern Europe with which most Western readers are likely to be familiar, the 1953 uprising throughout East Germany and the even better known Hungarian uprising of 1956, which occurred after Stalin’s death. It is deeply misleading, Applebaum argues in “False Dawn,” to consider the communist takeover of Eastern Europe as coterminous with the end of World War II. Stalin’s initial policy was to “tread softly, not to upset the Allies, and to win people over by persuasion or stealth” (p.89). Communist parties were “under strict instructions to disguise or deny their Soviet affiliations, to behave as normal democratic parties, to create coalitions, and to find acceptable partners among the non-communist parties” (p.67). During this period, social democracy — advocating policies “which, by modern standards, were very left wing” (p.194) — appeared to be on the rise in Western Europe. The USSR and its Eastern European communist allies thought that something resembling real democracy, with pluralism and free elections, “would work in their favor” (p.194). Thus, there was no economic revolution in Eastern Europe in 1945. The state “took control of the economy in small batches. The new regimes began with the reforms that they guessed would be most easily accepted” (p.224). Simultaneously, the Soviets set about to undermine civil society and replace it with a view of the public sphere as “universal and univocal” (p.151). Far more than is usually acknowledged, a “profound suspicion of civil society was central to Bolshevik thinking” (p.151). Relying upon a cadre of hard-core, dedicated communist party members, “police forces were put in place, civil society was subdued, the mass media were tamed” (p.223). Strong Ministries of Interior, capable of spotting and checking not only actual opponents but also potential dissidents – people who seemed unlikely to support the communist system – were key to concentrating power. Throughout Eastern Europe, communist control over the secret police gave them “outsized influence over political events. Through the selective use of terror, they could send clear messages to their opponents, and to the general public, about what kinds of behavior and what kinds of people were no longer acceptable in the new regime” (p.115). In general, secret police in Eastern European countries were carbon copies of the Soviet model, “in their organizations, methods and mentality,” to the point that they were termed “little KGBs” (p.68). The East German Stasi, in particular, “mimicked the KGB to an extraordinary degree” (p.82). Among the most suspect in each country were its freedom fighters who had fought the Soviet Union’s enemy, Nazi Germany, many of them communist by inclination if not outright party members. If they could oppose Nazism so fiercely, the communists appear to have concluded, they could easily turn on the new regime– indicating, perhaps, that the communist apparachiks in Eastern Europe and their backers in Moscow were aware at some level that what communism offered the citizens of Eastern Europe was not significantly more palatable than Nazism. By the end of 1948, Stalin had effectively eliminated his most capable opponents throughout Eastern Europe, marking the advent of the period of “High Stalinism.” Eastern European communist parties and their Soviet allies then began a “very long-term effort to corrupt the institutions of civil society from within, especially religious institutions. The intention was not to destroy churches but to transform them into ‘mass organizations,’ vehicles for the distribution of state propaganda” (p.255). Social democracy, despite its deep roots in the region, “vanished from the political arena, along with large private companies and many independent organizations” (p.249). directly mimic Soviet domestic and international policies in the hopes of eliminating their opponents for good, achieving higher economic growth, and influencing a new generation of firm supporters through propaganda and public education. Until Stalin’s death in 1953, all of the region’s communist parties would pursue an identical set of goals using an identical set of tactics (p.250). Although a renewed attack on the enemies of communism was the “most visible and dramatic element of High Stalinism,” Applebaum regards the creation of a “vast system of education and propaganda, designed to prevent enemies from emerging in the future” as “just as important to the Eastern European communists. In theory, they hoped to create not only a new kind of society but a new kind of person, a citizen who was not capable of even imaging alternatives to communist orthodoxy” (p.255). From 1948 onward, the theories of Marxism-Leninism “would be explained, expounded, and discussed in kindergartens, schools, and universities; on the radio and in the newspapers; through elaborate mass campaigns, parades and public events” (p.255). there was an opposition. But it was not an active opposition, and certainly not an armed opposition. It was rather a passive opposition, an opposition that sought outlets in jokes, graffiti, and unsigned letters, an opposition that was often anonymous and frequently ambivalent (p.413). The harshest features of communist regimes died with Stalin in 1953 or shortly thereafter, but “even-post Stalinist Eastern Europe could be harsh, arbitrary and formidably repressive” (p.463). the Bolsheviks, their Eastern European acolytes, and their imitators farther afield attacked not only their political opponents but also peasants, priests, schoolteachers, traders, journalists, writers, small businessmen, students, and artists, along with the institutions such people had built and maintained over centuries. They damaged, undermined, and sometimes eliminated churches, newspapers, literary and educational societies, companies and retail shops, stock markets, banks, sports clubs, and universities (p.467-68). if enough people are sufficiently determined, and if they are backed by adequate resources and force, then they can destroy ancient and apparently permanent legal, political, educational and religious institutions, sometimes for good. And if civil society could be so deeply damaged in nations as disparate, as historic, and as culturally rich as those of Eastern Europe, then it can be similarly damaged anywhere. 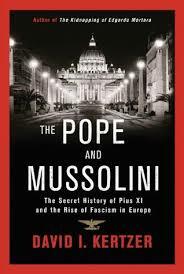 If nothing else, the history of postwar Stalinization proves just how fragile civilization can turn out to be (p.468). Today, the iron curtain across Eastern Europe has been lifted for nearly a quarter of a century and, as we look back to the communist period, it is easy to see the regimes as doomed to failure. One of the many virtues of Applebaum’s richly-detailed work is that she forces the reader into a time and a perspective in which the unsustainability of the communist regimes was not at all apparent. To the contrary, many on both sides of the Iron Curtain regarded this gloomy and oppressive totalitarianism as entrenched for the foreseeable future. Individuals as diverse as Nikita Khrushchev, John Foster Dulles, and Hannah Arendt agreed that “totalitarian regimes, once they worked their way into the soul of a nation, were very nearly invincible” (p.461). Applebaum recognizes that the term “totalitarianism” is overused, much like “racism” and “fascism,” and today can refer to almost anything we don’t like — a “crude, imprecise and overly ideological” word (p.xxii). But she rightly says that we cannot comprehend the 20th century without an understanding of “how totalitarianism worked, both in theory and in practice” (p.xxiii). “Iron Curtain” constitutes a valuable contribution to that understanding.